Cambodia is not a country of many roads. In fact, every time I left Phnom Penh I ended up having to come back to get somewhere else. And although Siam Reap is North of the capital, I still needed to come back to town in order to head north to Laos. My route to Laos followed the Mekong River North. Because of the long distances, bad roads and limited bus schedules I had to spend my first night in the town of Kratie. Known for it?s proximity to the rare freshwater Irrawaddy dolphins, Kratie is a bit of a frontier town. There?s not much there besides a market and a lot of barber shops. Another girl and I decided to make the best of the situation and hire a motorbike out to see the dolphins. The boat was very peaceful as the sun set across the Mekong. We watched five dolphins play in the current, turning on their backs and jumping around. The next morning, while waiting for the boat North I walked around town, amusing the local residents by taking photos of barber shop signs. An old man was selling flavored ice from the back of his bicycle and I my camera quickly attracted the attention of the small children buying treats. One girl in particular was enamored with my camera. She wore a pink princess dress and wouldn?t let me take a photo that she was not the focal point of. She desperately wanted to keep my camera and kissed the LCD screen with her sticky mouth each time she saw herself on screen. After our photo session she started the ?pick me up? game. It was very simple–a child would walk up to me and I would pick them up and then put them back down. This last a good ten minutes before it progressed into the ?twirl me around? game where I lifted each child up and twirled them around. Although I was stuck in this town on the road to Laos with nothing to do I still managed to have a good time playing with the locals. You can see a progression of the photoshoot in the image below. The road North of Kratie is in terrible condition so I opted to take the fast boat upriver to the town of Stung Treng. Once again, I was stuck for the night only an hour south of the Laos border. This town had even less than Kratie, not even cute children to play games with. I watched from my hotel as irritated Westerners tried to bargain with drivers for rides to the Eastern provinces. The town felt like one big rip off. Because the locals know people are only in transit they try to get as much money as possible for the smallest things. I had arranged a slow boat to the Laos border but in the morning was told that my fellow passengers had overslept and I would need to take a speed boat instead. The speed boat was a tiny fiberglass shell which didn?t seem to touch the water at all. The fact that my driver was wearing a helmet didn?t ease my mind at all. For the entire hour?s journey I sat, wind stinging my face, devising a plan for when the boat stuck a rock and tipped over. Would I hold my small bag with my camera above my head or would I try to rescue my heavy backpack from sinking to the bottom of the Mekong? Thankfully, the boat arrived to the deserted bank where the Cambodian official waited to take $1 from me (for the stamp–wink wink) in one piece. My fellow passengers weren?t so lucky, as I was the only person out of six granted an exit stamp. The driver continued to the opposite bank to drop me off at the Laos border where the officials asked for another dollar and arranged a moto driver to the islands. Most tourists travel through Thailand to get to Laos because the roads are better and travel is easy. In the end I?m glad that I spent the extra effort to make it up the Mekong. You can see the photos from Northern Cambodia here. There is nothing that defines Cambodia more than Angkor Wat. Although Angkor Wat is one of the best preserved Khmer temples near the town of Siam Reap, there are more than fifty temple complexes in the immediate area. Being my ever-ambitious self I decided that I needed to see as many temples as possible–no temple was too obscure. Cambodia can be very inexpensive to travel in but the visitor fees to the temple area is comparable to Western attractions. Passes cost $20 (1 day), $40 (3 days) or $60 (7 days). I woke up my first morning in Siam Reap, rented a bicycle and made my way to Angkor Wat with my 7-day pass. I was determined to conquer any temple I could find. I got off to a slow start, spending my first day at only two temples–Angkor Wat and The Bayon. As I first approached Angkor Wat I saw a number of elaborately dressed Cambodians. It turned out to be a large wedding party taking photos. The bride, groom and bridesmaids had atleast four costume changes. Some were western wedding costumes but the majority were brightly colored traditional clothes made of silk. The temple itself is well preserved and is covered in amazingly detailed relief carvings. I decided to climb to the top story of the structure, up steps that were narrow and steep even for Westerners. Reaching the level of the gods is not supposed to be an easy task. Getting down was another challenge. After my my first two days of bicycle riding around temples and their grounds I was completely worn out. I woke up on the morning of day 3 nearly unable to move. Forfeiting a day of my pass I spent the day sleeping, getting massaged and hanging out at a wonderfully Western cafe providing free wireless internet access. After my day of relaxation I was ready to tackle a few of the more out of the way temples. I hired a moto driver to take me to a river two hours outside of town. The journey took us down a mud road full of potholes and broken bridges. My white shirt was covered in red dirt but was not the only casualty of the day. As we were riding I noticed my driver checking the tire every once in a while. After a while we drove by two young men on bicycles and stopped for repairs–apparently we had a flat. The bicycle repairmen pumped air into the tire and we arrived at the riverbed in one piece. I was careful on the path to the river because this attraction was one of the few Angkor-area attractions that hadn?t been cleared of land mines. Because I hadn?t seen one other tourist on the two hour journey I was convinced that I would be the only tourist at the river. There turned out to be More than one German tour group and a good sampling of Koreans. Although the riverbed was covered in carved stone I?m not sure that the arduous journey was worth the effort. On the way back to town we stopped at another far-flung temple known for it?s exemplary relief carvings. At this point I was starting to get a bit weary of the temples but my moto driver and I drove on, stopping at every temple on the way back to town. My driver turned out to be an amateur–he was only trying to supplement his regular teacher?s income on the weekend by taking me around. We ran into each other the rest of the week, he felt bad oversleeping on the morning we were supposed to see the sunrise so he gave me a number of free rides into town. I spent two more days seeing temples, mostly by motorbike. Most foreigners only spend 1-2 days at the temples but I was glad to spend my week in Siam Reap, these kind of ruins can?t be seen anywhere else. You can see the photos from Siam Reap here. This morning I woke up at 4:15am and hired a moto driver to take me to a hilltop temple named Phnom Bakheng to see the sunrise. As I climbed up the hill over crumbling rocks and misplaced boulders it became obvious that I was a bit early for sunrise. I was the first person on top of the temple which was very exciting and very scary. Although I brought my small flashlight with me the site is not lighted and I was not aware of it?s layout. Assuming the temple faced East I walked down what appeared to be a causeway until I came to steps. Gathering my courage, I scaled the narrow, steep steps until I could go no further. Looking up I came face to face with a large lion. It obviously turned out to be a statue but I was so surprised I nearly fell back down the stairs. At the top of the temple I could only hear the rustling of wind in the trees and tried not to look too closely at the decapitated Buddha statues. I sat alone, watching the moon and stars for another twenty minutes before a few other people arrived. The sky turned to a gray and then a light blue so gradually that I hardly noticed. Because of the clouds the sunrise wasn?t as glorious as one would expect, getting up at 4:15, but it was certainly worth doing once. After nearly three months of travel it was time to hit the beach. I am not a beach-lover really, but I decided the southern town of Sihanoukville would be a nice place to relax from traveling for a few days. I arrived in the late afternoon after a five hour bus ride and decided to stay near Serendipity Beach. Walking around I was approached by a nice woman who asked me to sit at her beach shack. I told her I would come the next day and stuck to my promise. She seemed surprised that I came back but I had my reasons. Her shack was on the far side of the beach, nearly 20 minutes walk away from my hotel in a very quiet area. I was willing to walk down the beach, past the Western tourists and past the Cambodian tourists to have a bit of peace and quiet. I refused all attempts to get me on a motorbike to see waterfalls or on a boat to see islands. I sat at the Dolphin Shack for five days, drank fresh pineapple shakes and read two books–it was amazing. I?ve heard that Phnom Penh is a rough place. Cambodia has been through so much, so recently, that I was surprised to see any kind of prosperity or Westernization. It turned out that the Cambodian people go on with their day, remembering the past but looking forward to a bright future filled with tourists? dollars. 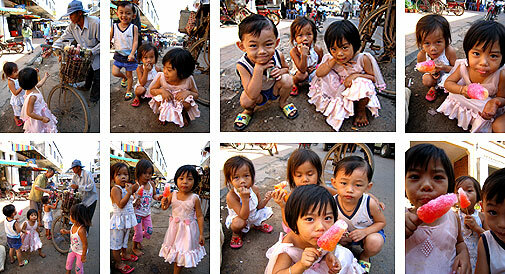 Although Cambodia?s much poorer than Vietnam the people seem happier–always laughing and playing. Kids run around the street with no clothes on (and this is the capital!) and moto drivers laugh and agree to bargaining instead of getting angry. By complete coincidence I arrived in Phnom Penh just in time for the 3-day Water Festival in which there are boat races, rides, food stalls and a general feeling of celebration. A lot of travelers seemed to escaping from the festival but I found it completely fascinating, especially because I love cities. For three nights the sky lit up with huge firework displays and I couldn?t help but think about what a waste it was for such a poor country to be spending it?s money this way. Aside from a few Buddhist pagodas, the Royal Palace, the Killing Fields and the Genocide Museum there wasn?t much to see in Phnom Penh. I happened to be at the Palace on a Buddhist holiday and saw the king emerge from the residential wing and wave to the masses from behind the high gates. I?m not sure how anyone could tell which one he was, there were a number of little men wearing white shirts, until he started waving. Cambodia is probably most well-known by Westerners for the Khmer Rouge and the mass killings orchestrated by Pol Pot. The Killing Fields are about a half hour outside of town surrounded by rice fields and little villages. A shrine containing the skulls found in the mass graves has been erected but the site is mostly a large number of holes in the ground where some of the mass graves were unearthed. The most disturbing thing I saw on the site was cloth sticking out of the ground where the soil is being worn away by tourists walking around. It?s not easy to look down and see part of a blindfold sticking out of the soil in front of you. After that I visited the Tuol Sleng Museum which is housed in the former ?security prison 21?–the largest detention and torture facility in the country. Housed in a former school, the prison was converted into small wood or brick cells with larger rooms being used for the torture of officials. Inside is a display of the mug shots of the people who passed through S-21 and were later taken to the Killing Fields. A disproportionately large number of them were children, even girls. One striking photo was of a woman holding her baby during her mug shot. It is truly sick to know that this happened in the late 1970?s, the guards even appropriated the playground equipment for torture devices. I would like to learn more about the entire Pol Pot regime and it?s recognition worldwide. I can?t believe this happened for years with no help from the outside world. What will stop it from happening again?